Away latish after tidying up some internet stuff, then a fairly undistinguished run through agricultural farmlands as well as long stretches of industry. Bought fuel to use up our remaining Turkish lira, and the attendant asked whether we would like the (filthy) van washed. Yes, we said, but we’ve got no money. No problem, wash is free he replied. So we were shepherded into a large truck wash facility, and were given a quite thorough detergent and spray pressure wash by a wee man to whom we gave a few liras change. A great relief to have presentable transport again. Continued up the good highway through Edirne and to the border with Bulgaria. No real problems, just a few queues, going out of Turkey, then a bigger queue going into Bulgaria, where all cars including us were searched for illegal passengers. Some three-quarters of an hour in total, including purchasing a vignette giving us access to the motorways for a week. Not a lot further to our camp site for the night, recommended by a Pom whom we’d met way back in Seljuk. A very pleasant little site, owned by Brits who’d fallen in love with the country and built a house and the camp site. Enjoyed some very acceptable local Merlot in the evening (not as good as Oz, though!). Joined by a pleasant young German couple with a baby, enjoying their generous maternity/paternity leave. Peaceful, hot day. Walked down into the very simple village of Biser. At the only shop we were told quite firmly in response to our query about bread, “no”. On our Turkish road map, Bulgaria is called “Bulgaristan”, and we see an immediate difference between the quite open, smiling faces of the Turks in comparison with the rather dour default expression of the Balkan Slavs – but which soon lightens up once communication is established. Spent the rest of the day reading, cleaning up the web log for “publication” while we have good free wi-fi, and chatting to the German couple and another lone German who, on his annual holidays, has the ambition of cycling in every country in Europe. When he said he had been in over 40 countries so far, I expressed amazement that there were so many; I checked later, and counted 48, including Turkey (which is partly in continental Europe). Norma spent some time cleaning out the inside of the van, with its film of Turkish dust, and catching up with the washing. Decided to stay another day in this attractive little site. Matt, who runs the place, and Martin, his father, are among the many expat Brits in Bulgaria, with houses and businesses in the country. The movement started when property prices were very low, but although rising property prices were a money-spinner for the many locals there are now problems with affordability and many expats are moving out. In the afternoon, followed the German GP on the iPad live timing app, and were pleased that Andy Murray won at Wimbledon. On our own overnight, and away at a relaxed pace towards the north and Veliko Tarnovo. We took a distinctly deviant route because I wanted to take in the 1,305 metre Sipka pass and we wished to see what is known as the woodworkers’ village of Trjavna on the way. So most of the time we were winding our way up hill and down dale through thickly forested mountain countryside, part of the Stara Planina (Balkan) range, much of which is the Central Balkan National Park. The 1,300 metre Sipka Pass is important to the Bulgarians because it was the site of an important battle in 1877 that helped to secure the independence of their country (although there was a lot more confrontation to come). 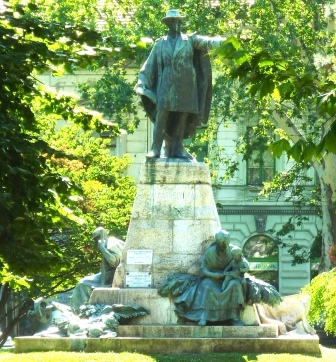 For years there had been several Bulgarian revolts against the ruling Ottoman Empire, culminating in the April Uprising in 1876. The Great Powers formed a coalition with Bulgaria and were joined by the Russian Empire, which declared war on the Ottomans and secured a famous victory, alongside the Bulgarians, on the Pass. At the top of Mount Stoletov there is a massive Freedom Monument that can be seen for miles, and on the approach road there is an ornate Russian-style building in remembrance of their dead. Soon after traversing the steep and winding pass we made a deviation on to more steep and winding roads to the little town on Trjavna. It has the usual Russki-style blocks on the outskirts, but the old town is centred on a delightful square and old bridge, off which lead streets of shopfronts which once enclosed woodworkers and other craftsmen, but which now mostly house tourist tat. But which look good anyway. We have been to Bulgaria before, with very fond memories of the three weeks in 2005 we toured the country in a rental Skoda with Anita and Ron – many laughs all the way. This time, we have already noticed two great improvements – the state of the roads and the state of the driving. The pothole situation is nowhere near as bad as it was. When we rented the car, we declined extra insurance to cover damage to the underside of the car. Once on our way, we understood why people took it, although in the end we did get away with it. We have come across a few potholes already, of course, but on very minor roads only. Although by international ratings they still have poor surfaces, the major roads are far better than they were. And on the driving, the police have obviously clamped down as part of the EU road safety campaign, you see a lot of them around, and the driving standards so far encountered seem to be no worse than the rest of eastern Europe and better than Turkey. Furthermore, most of the significant road direction signs are in Roman as well as Cyrillic script, which means that we don’t have to decipher each one letter by letter, as we did in 2005. Towards the end of quite a long day’s drive we drove into what seems to be a feature of these parts this year, the late afternoon thunderstorm The rain was torrential, and when we arrived at our planned camp not far out of Veliko Tarnovo the water was streaming over the grass pitches. Wary of getting stuck, we stayed the night on one of the gravel vehicle paths. This was another of the informal grouping of campsites among like-minded owners; again owned and run by Brits, this time a couple, everything was immaculate, free wi-fi, a restaurant if you wanted and a beautiful swimming pool. And we shared the site with only six other campers. Today we took the van into the town of Veliko Tarnovo, finding a parking place with some difficulty in the frantically busy and rather chaotic traffic in its outer reaches. Veliko Tarnovo is the place most visited by tourists in Bulgaria, apart from Sofia. Its central area is extraordinarily attractively located, with the older parts strung out on the precipitous sides of the gorge of the sinuous Yantra River. High on a hill overlooking the whole are the ruins of a vast citadel, the 5th to 12th century Tsaravets Fortress. The walls round the hill once enclosed a city of about 400 houses and 18 churches, and perched at the top are the remains of the palace of the patriarchs and church. The complex makes a grand walk, and rather to our surprise there were fewer tourists (and only one bus!) than we encountered in 2005. Camp site operators are among the very many operators of tourist enterprises that say that the times are hard: “the crisis has hit all of us”. Tarnovo was once the capital of the Bulgarian state. Following a series of attacks the Byzantines had ended the first (Slavic) Bulgarian Empire in 1018, but a hundred years later nobles of the Assen dynasty organised a major uprising that re-established the Bulgarian state and the foundation of the second Bulgarian Empire with Tarnovo as its capital. An elegant (as opposed to Russki monumental!) set of statues on a promontory in a bend in the river commemorates these events. 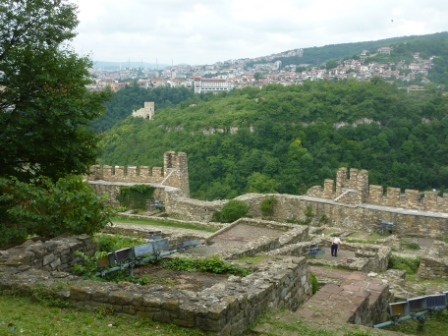 The economic and religious influence of Tarnovo challenged that of Constantinople, but the good times fell to factional divisions and in 1393 Tarnovo fell to the Ottomans – and humiliating subjugation – following the latter’s successful siege of the fortress. We had lunch in the town, our first exposure to a local restaurant, sitting on a terrace overlooking the river far below. We shared both an excellent oven-baked pork dish and superb goose livers with onions, much better than we expected, and inexpensive. Leaving the site we had a most interesting conversation with an American couple who for 12 years have been touring for six months each year in their van, world wide. It made us think once again of the possibility of camper touring North America in the future . . . who knows. As mentioned, it was not our intention to re-explore all that is great to see in Bulgaria, but simply to take in a few special places on our way back up through the Balkans. So today was another quite long drive west, mostly through rolling agricultural countryside with the hills to the north of us, ending up in a tiny little site in the foothills of the Balkan range, by ourselves among the trees on the side of a little river. The lady who welcomed us – a neighbour of the owner, who apologised for not speaking English – asked if we wanted the wi-fi password. We have ceased to be surprised how easy it is in some surprising parts of the world to access the web. Bulgaria has a substantial IT sector, generating 10% of its GDP, and has the only supercomputer in south-east Europe. Its average broadband internet speed is the second-highest in the world after South Korea! (Eat your heart out, Northern Beaches Sydney.) Anyway, it seems taken for granted here that visitors will appreciate free and easy access; take heed, all those hotels and other enterprises that soak tourists and business visitors with exorbitant fees for internet access! 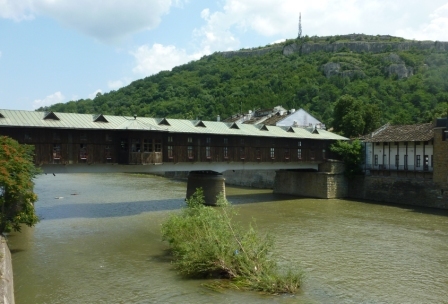 On the way over we did make a short deviation to revisit a small town with a remarkable covered bridge, Lovech. The bridge was as we remembered, but many of the shops within its walkway had gone down-market and others were shuttered. The same was true for the rest of the old town, which had a rather run-down look. Bulgaria is going through a hard time economically. The average income is about 45% of the EU average, although the cost of living is also low. Rates of growth were high until the world financial crash in 2008, after which the country went into recession until 2010. There is now massive debt, and austerity measures are having severe social consequences. The government has sensibly declined to join the eurozone, although the lev is tied to the euro, but endemic corruption is another obstacle to economic growth. Norma was out before dinner collecting raspberries, and munched a few plums. Plums trees and their fruit are everywhere at this time of the year in Bulgaria, and Norma has been collecting plums every time we stop. We even saw a man laying out a plastic sheet in a roadside lay-by, preparatory to shaking the plum tree. We enjoyed pork with plums for dinner. 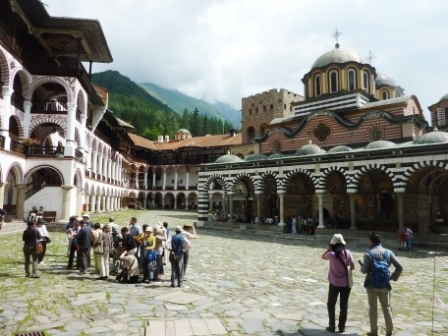 One of the greatest sights in Bulgaria is the Rila Monastery, in the Rila National Park. It may be one of the greatest tourist attractions too, but that is the result of its supreme presence and wonderful location. So we decided to go there again, on our rather quick traverse of Bulgaria. Out of the hills quickly, then a dreary industrial run round the outskirts of Sofia to the main road south through farmland towards the monastery. The road varied between high-standard motorway, through roads being built, to simple, rough, two-way roads. “Rehabilitating” the highway is an EU project, we learnt from the roadside signs. Heavy and often very slow-moving truck traffic meant a morning-long run down, finally up into the mountains and the monastery by about 11:00 am. The monastery was very much as we remembered it: truly spectacular in terms of location, overlooked by cloudy mountain tops, its climate, overcast, and presentation. It is little wonder that it is a UN World Heritage site. 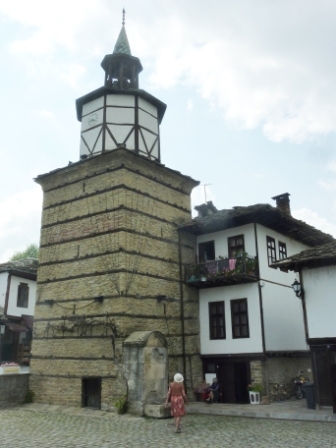 It is one of the monasteries in remote areas where the Bulgarian culture, religion and language were kept alive during the rule (referred to as “slavery” in plaques at the monastery) during the time of Ottoman rule. It was first built in 927 and heavily restored in 1469. Comparing the photos we took in 2005 and 2013 shows very little has changed, including the large number of tourists – maybe eight tourist buses in the car park. But the tourist groups are tightly controlled, apart from a few individualists, and so it was possible by careful timing to explore the complex without tripping over too many people – mostly Japanese, it seemed this day. We thought the painting of the buildings had been touched up, and certainly some of the frescoes and parts of the interior of the Church of the Nativity had been freshened, and the only real change was that we could not climb up to the several upper levels. Accommodation has clearly become an income-provider, and all the stairs were blocked off. Pity, because the best views of the complex are from the upper stories. For lunch, we got to our camp site, Zodiak, a few kilometres further up the mountain – and further into the cloud base! Not much of a site, and we placed ourselves – alone, apart from a parked bus and a couple of cars – in a field beyond a collection of small chalet units. Sprinkled with rain during the afternoon, so spent the time reading and planning our forthcoming passage to and though Serbia. Better-looking morning, but very cool early. First, a necessary run to the Lidl at Pernik, and a stock-up for the next day or two at a ridiculously low price. Then filled up with diesel with the rest of our Bulgarian leva, the small change going on a couple of Mars bars. A very pleasant run then along a minor road towards one of the “lesser” (i.e., non-truck) border posts. The roadsides and most of the fields were alive with wild flowers, to an extent we had not seen before. This north-west corner of Bulgaria did seem rather remote, though, and farming seemed not to be intensive, to say the least. The border post was fine. The EU Bulgarians for some reason did a quite thorough search of the lockers in the van, having asked whether we had anything to declare (“er, no”, replied Norma), although as we were leaving, all that didn’t seem to make a lot of sense. They asked me where we were going. “Er, Serbia”, I replied. At the adjacent non-EU Serbian post, they had a quick squint into the van and then a bit of a chat about where we should visit. They didn’t even want to see our car or insurance documents, which were supposed to be such a big deal. Serbia undoubtedly has something of a negative image among those who know little about it, mainly because of the actions of Slobodan Milosevic. But it has a long history as a proud nation state, over hundreds of often turbulent years, along with its several Balkan neighbours. (Landlocked, Serbia shares borders with seven other countries plus Albania via the disputed region of Kosovo.) In the 8th century the Serbian Principality was established, and its reach covered most of Dalmatia. It has been invaded by Celts, Illyrians, Romans, Turks, Austro-Hungarians and – briefly – Germans. The Serbian Kingdom was recognised by Rome and Constantinople in 1217, and its status was raised to that of a Serbian Empire in 1346. Its golden years in the 14th century faded after the start of its fall to the Ottoman Turks in 1459, but in the early 19th century the Serbian revolution of 1804 to 1815 established its independence from the Ottomans and its status as the region’s first constitutional monarchy, pioneering the end of feudalism in the Balkans. Serbia became a relatively innocent trigger for the First World War when one of its citizens, Gavrilo Princip, shot Archduke Franz Ferdinand of Austria in Sarajevo. This gave Austria-Hungary an excuse to invade Serbia, at Germany’s urging, Russia supported Serbia, and the game was on. Between the world wars Serbia co-founded Yugoslavia – literally, “southern Slavs” – with its immediate Balkan neighbours, and this existed in various forms until 2006. WW2, however, was tremendously disruptive; Yugoslavia was disrupted by the Axis farces, Serbia was occupied by Germans, and the Axis puppet state of Croatia, led by Ustase fascists, committed persecution and attempted genocide of Serbs, Jews and Roma. (In Croatia last year we visited the Ustase concentration camp at Jasenovac, where so many thousands of these people died.) After the war Yugoslavia was re-established by the communists, but its leaders – including Tito – resisted too close an association with the USSR. In 1989 Slobodan Milosevic came to power in Serbia, awakening nationalism and igniting tensions with the communist leadership of the other republics through demanding Serbs in their nations were part of “Greater Serbia”. This resulted in the breakup of Yugoslavia, with Serbia and Montenegro remaining united for a time as the Federal Republic of Yugoslavia (FRY). Continuing ethnic tensions then brought about the Yugoslav wars. Ethnic Serbs in Croatia and Bosnia violently opposed independence from Yugoslavia, and the conflict was supported by the FRY. Milosevic fell in 2000, and in 2006 Montenegro became independent of Serbia. Serbia applied for EU membership in 2009 and became an official candidate in March 2012. Serbia is now a respected parliamentary democracy and middle-income economy. We’ll return to Milosevic. When we cruised the Yugoslavian coast in 1987, I always said he’d be trouble. Norma was also a bit concerned about the heavy arms carried by a friendly Serbian border guard, and by gunshots in the countryside near the site. “Game”, we guessed, wondering whether we should wear our yellow jackets (mandatory vehicle equipment in most of Europe, but so far unused). Carefully wended our way down a muddy track into the grassy site among the birch trees and pines, as advertised next to the lake. They have had four days of rain here, which had been obvious from the mud on the roads, and not getting the van stuck was a primary concern. Nice surroundings and plenty of space, but not much of a camp, facility-wise, with a handful of other campers and several permanent caravans sitting around, mostly without even wheels, looking derelict. I chose not to use their power supply, with its dangling wires and plug boxes. But the sun shone well into the evening, which was a nice change. Less pleasant was the sound of gunshots after dark. Very cold in the morning; we were camped at nearly 1,500 metres. Earlier start than we later realised, as the clocks went back an hour when we entered Serbia and returned to central European time. Blue skies, though, and an initially very pleasant run through lush and heavily wooded valleys. Stopped in the town of Leskovac to find an ATM, and got thousands of dinars-worth, some of which were needed for the motorway north. Cut west off the motorway in central Serbia towards the mountains. After a while, around the large town of Kraljevo, it became very industrial. A striking feature was the large size of the several car sales yards, intriguingly matched by the vast size of the sprawling car wrecking yards! 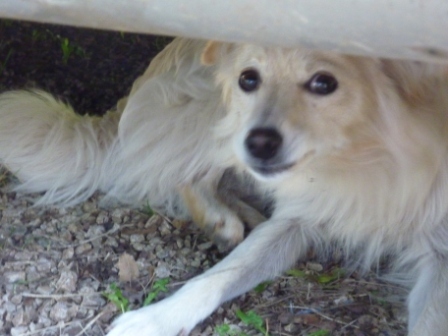 Norma promptly made friends with two camp-site dogs, both probably small collie mongrels, particularly one very pretty and friendly whitish-coloured one. She assured him that we would like to take him with us, and made sure that he was well fed while we were there. Dog under van, waiting for breakfast!Dog slept under the van, we thought, and duly got his breakfast – rather uneatable pressed tongue! Quieter overnight than we expected – the fact is, not many people were staying there, it just looked like a lot because nearly all the pitches were taken but unused. At least the overnight stay was very cheap. Decided first to have a look further to the west, where there is a national park and ski fields. However, once through the remainder of the gorge the drive to Uzice was through lots of industrial suburbs. There were no signs of any mountains or scenery on the horizon, so we retraced a few kilometres and then took a minor road to the north. This turned out to be a lovely run, through steeply rolling countryside, alternating between thickly wooded hills and good-looking very busy farms. The road surfaces were generally pretty good, too, which was another surprise. 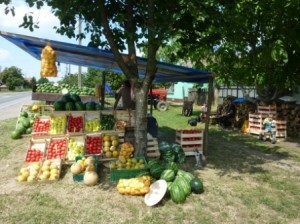 Through the town of Valjevo and down into the great plains of the northern region of Serbia, Vojvodina, with fertile arable land to the horizons on all sides. Fruit and vegetable plantations were everywhere, along with vineyards and wheat, and we stopped at a roadside stall (one of very many) to do a little stocking up. Bought tomatoes, onions, peppers and melons for an absurdly small sum from a smiling family group. Reached Sremska Mitrovica after a very pleasant day’s run, and then started looking for a camp site strongly recommended to us by a Brit couple way back in Turkey. We had the coordinates, but our Tomtom had no mapping whatsoever off the main highway routes, and as it (“she”) didn’t know where we were, she couldn’t tell us how to get there. Did a big circle round Sremska, finding ourselves stuck the wrong side of the big Sava river, but were rescued by our Autoroute digital mapping system, which runs via a GPS receiver on the laptop. So we got disentangled, and found our way to Camping Zasavica. 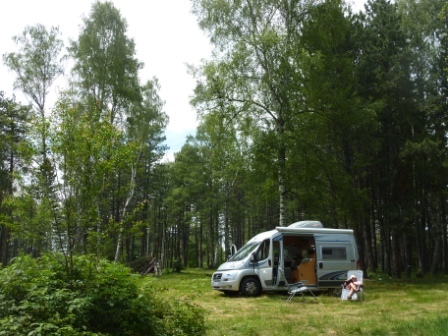 This turned out to be one of the nicest camp sites we have ever visited, probably the best of this trip so far: compact, no glitz, swimming pools or the like, just immaculate grassy pitches among young trees, fast free wi-fi and other facilities of hotel standard. It’s only a couple of years old, owned and run by a local man – Jovan Vukadinovic – and his family with substantial local landholdings and business interests. Its establishment has been aided by the government, which wants to raise the standard of Serbian camping facilities – no surprise there! Peaceful night, as to be expected, and a chat with Jovan and an Italian couple in the morning. Some laughs about finding the place! But agreement on its high standard. Also some discussion about the image of Serbia. The owner made the comment that he still feels himself a Yugoslav, seeing no real differences these days between the peoples of the Balkans. He was, however more dismissive about the people of Kosovo, whom he regarded as “different”. In the Ottoman times, the Serbs left the region to the Albanians, but after the Turks departed in 1913 the predominantly Moslem Albanians moved out. An autonomous province of Kosovo was established in 1974, but in 1989 Slobodan Milosevic notoriously suppressed this autonomy and began cultural oppression and forcible removal of the ethnic Albanian community. This led to brutal fighting (the Kosovo wars), the subsequent refusal of Milosevic to comply with international accords, and the controversial bombing of Serbia by NATO forces in 1999. Serbian forces withdrew and since then, the region has been under UN-NATO administration. It claims independent republic status, and Serbia claims that it is part of its territory. It is still possible to drive in and out of Kosovo from Serbia, but few we have met are keen to do so, and we have passed it by. Later, it was pleasant simply to relax in the sun in an excellent camp site. 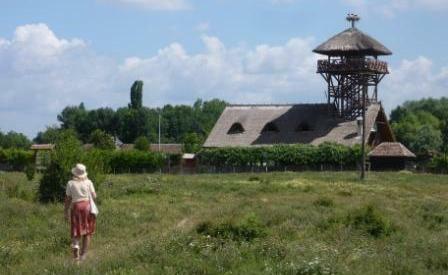 The site lies adjacent to a large area of wetlands which the Serbia Government has proclaimed a Special Nature Reserve. Jovan clearly has some interest in this, but we don’t know the details – we suspect he owned it originally and has a special deal with the government. Anyway, he gave us maps and other instructions and told us to enjoy a long, slow walk through it. The reserve’s visitor precinct is outstandingly well done, with storks nesting on top of a high viewing tower, immaculate lawns, a small restaurant and, we believe, a few rooms to let. To start the walk we passed a row of stalls holding examples of the rare indigenous fauna of Serbian genetic origin to be found in the reserve: animals such as Balkan goats, black Mangulika pigs, sheep, Prairie oxen and cattle – and Balkan donkeys. 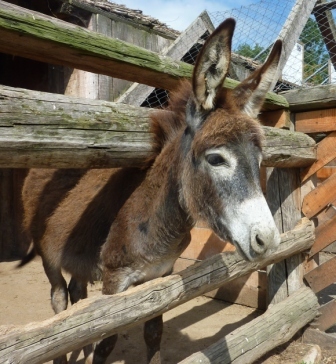 The donkeys here are particularly rare and special, slowly building up their numbers. Their milk has great benefits, we were told, being the closest non-human milk to human. They make cheese from it, the most expensive in the world, because the donkeys only lactate for a very short time. It was a lovely walk, with groups of animals of all these kinds wandering over the open reserve. 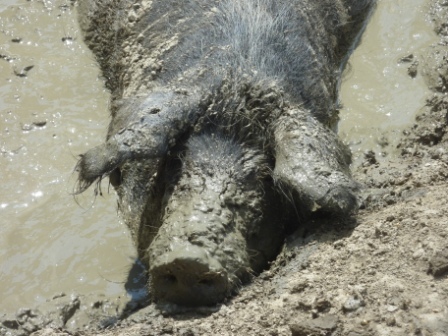 A small river meandered through it, swans and other water birds swan around or hid in the marshes, and the mud on its banks was very popular among the pigs, who literally wallowed happily in it, snuffling and grunting contentedly. There were no other visitors at all, so we had the place entirely to ourselves. In the evening, sitting outside and accompanied by a very pleasant Dutch couple with a caravan, we returned to the restaurant and much enjoyed the only item on the menu, an excellent goulash, along with local beer. Paul, a Brit by himself in a small motorhome has eaten there every night for the two weeks he has been here! About 25 km north of Sremska Mitrovica is a range of 500-metre mountains, running east-west as they rise out of the flat Vojvodina plain. This small range is a National Park called the Fruska Gora, the “Frankish Mountain”, so named when the range was part of defences against Frankish invaders. In Roman times it was known as the fertile mount, and it is still the location for many vineyards and orchards. 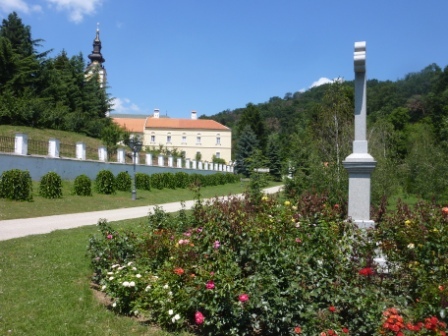 Between the 15th and 18th centuries no fewer than 35 monasteries were built there to defend Serbian religion (Eastern Orthodox Christian) and culture from the rampaging Turks. Some 12 are preserved and maintained today, and many others lie in ruins – not helped by damage caused during the NATO bombing in 1999. Jovan gave us a detailed itinerary he had prepared, along with a map, to ensure we saw the best and most accessible of them. Most helpful and just as well, because all are tucked away in small valleys, hollows and in villages, and are not easy at all to find. We started at Krusedol monastery, built in the early 1500s and shining white, surrounded by a defensive wall broken by a marvellous reddish gateway. The massive car and coach park outside was deserted, and so we were completely on our own again as we wandered round the precinct and gazed at some remarkably vivid frescoes in the church. Next was Grgeteg, another bright white monastery also dating from the 16th century, undergoing some patching up and repainting. Photos showed how damaged it was during the Kosovo events. It had a particularly attractive driveway leading up to it, with pruned trees trained to droop their branches downwards, which seemed unusual. Strings of garlic were drying in the arcades beneath the monks’ quarters. We bought a jar of assorted pickles as a small contribution to the upkeep of the buildings and the beautiful flower gardens in and outside them. None charges for entry. The Novo Hopovo monastery is another of the “popular” ones (although popular is a relative term – we were lone visitors at all of them). This was not rendered or painted, giving it a more medieval look although its construction was at about the same time as the others. There are more splendid and well-preserved frescoes in the church, in which we handed over a small sum for a bottle of plum brandy made by the monks. This is the popular local version of raki, grappa, slivovitz and similar distilled spirits, with an alcohol content of about 50%. (We had a couple of teaspoonfuls of it after dinner!) And finally to the Ravanica monastery in Vrdnik, another that was shining white in the bright sunlight. Decided to take a closer look at the local town of Sremska Mitrovica, and drove in as far as the large pedestrian bridge that crosses the Sava river. The road bridge is a good deal further along, and the pedestrian bridge is very popular with folk who live in villages on the southern side of the river and walk or cycle across to the town. 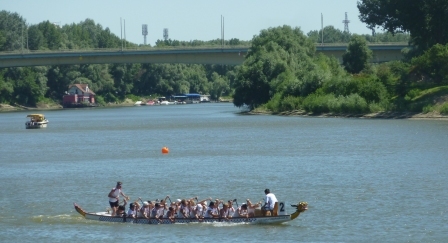 The Sava is a big river, which joins the Danube in Belgrade on its way to the Black Sea. These rivers and others that meet the Danube have always been Serbia’s route to the seaways, and while not so important as such now, there were once large port facilities in Sremska to service river ships. 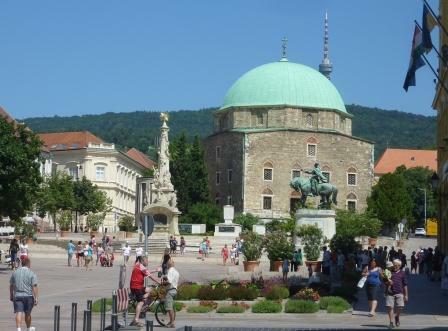 It is a nice little town, typical of eastern Europe, with a central square and park, some attractive buildings, and a marketplace. The town was active and lively, including young and old people. The vast majority of people in the population now are ethnic Serbs, following the kind of population exchanges that have caused such death and misery in Turkey and the Balkans and other parts of Europe. One effect of this in Serbia is that it has the largest refugee population in Europe. About half a million Serbs left Croatia for Serbia during the Yugoslav wars, and in Croatia last year we saw many buildings and entire villages that were once Serb and are now deserted. Serves them right, might be the response of Croatians who had seen their villages and historic towns like Dubrovnik shelled by Serb artillery from the highlands behind them. Internally displaced Serbs have left Kosovo as Albanians replaced them. But Serbs, especially those with higher education, are leaving the country in hundreds of thousands, and the age distribution is heavily weighted towards the older people because of low birth rates. The result is that Serbia has nearly the most negative population growth in the world. We can only deplore the effect of senseless “minor” wars over cultural and ethnic issues, and the malign influence of maniacs like Milosevic on a country that could be doing so much better. The economy is heavily reliant on services and foreign investment, and a comment from the camp site owner was that the Russians are moving in. We can only hope that their intentions are as benign neighbours! Later, a peaceful afternoon, in still and hot air, reaching about 34 degrees. 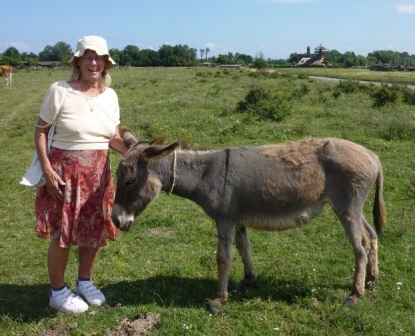 A clear sunny morning again, and we did an early walk back into the reserve for Norma to have another chat with the animals. Were thinking of going, but another quiet day in the (hot) sun was more appealing. Moved pitch in the afternoon after getting German neighbours in a big van with a noisy air-conditioner; shadier anyway, and a better pitch all round. A few more chats with Paul about good war books. Very pleasant and interesting chat with Jovan and his Novi Sad friends about the Balkans with particular regard to Serbia, its people, culture, and some politics. We agreed on how confusing it all is! Jovan felt that the region was perfectly OK as Yugoslavia, and it was terrible that the individual states had started warring over nationalism and religion. Finally away with farewells all round, and a marvellous present from Jovan to his “special guests” of two books on birds and butterflies of the Zasavica. We felt really good about that, and very grateful. Called in first to the supermarket in Sremska and then away north, bypassing Novi Sad on a devious route through the suburbs of this large city, the second biggest in Serbia. Then a long, straight drive up the motorway (cheap toll, €5 paid at half way) to the border with Hungary. Hugely long queues approaching both sides of the border, and it took over an hour of waiting to get out of Serbia and into Hungary. Not far then to Szeged, a city on the banks of the River Tisza that we had visited before, in 2008. Once again we camped pretty much by ourselves on the riverbank on the south-east side, disappointed this time to find that the marvellous hot spa pools were out of action. Doubtless this is primarily because just across the way there has been built an immense water-based playground. Some heavy clouds later, no rain, temperature moderate because of them and some wind. The siren sounds of emergency vehicles on the road running along the riverbank on the other, city, side of the river were well remembered from last time! Lots of dragon boats out training, looked faster than those in Rozelle Bay. We had a terrible night’s sleep, because directly over the water from us was a floating bar-restaurant that became an exceptionally loud disco, in full “song” all night until the early hours of the morning. The lady in the camp site office thought that it would probably not happen again tonight. We certainly hoped so! Sunny quite cool morning, strong northerly following the change, good conditions for a morning walk over the Tisza river into Szeged. The Tisza, like the Danube, runs north-south through the country, and they meet just north of Belgrade. Szeged is at the southern end of the Great Hungarian Plain, which takes up about one-third of the country and is in turn part of what the Romans called the Pannonian plains. We traversed the Serbian part yesterday, driving north from Novi Sad. We have visited Hungary twice before, first in an extensive tour in 2009 and again last year in transit from Croatia to Slovakia. We have always enjoyed it here. Since the original Magyars rolled in from somewhere east of the Urals in the 9th century the history of Hungary has been one of conflict, through Byzantine times, internal feudal disputes, battles with the expanding Ottoman empire, then division and reformation as part of the Habsburg Empire in alliance with Austria and Germany. Under the anti-Semitic prime minister Bardossy de Bardos Hungary sided with Germany in WW2, and hoping to keep on side with Hitler assisted in the large-scale deportation to Auschwitz of Hungarian Jews, then a large proportion of the population. After the war the Communist prime minister Matyas Rakosi led a strongly pro-Soviet government that was finally challenged by the 1956 Hungarian Revolution. Russian attempts to reinforce Communism gradually faded, as it did it the other post-war Soviet satellites, and the process of reform had gathered way strongly by 1990. Hungary has a very Western feel about it now, with relaxed clothing standards, young people speaking English (partly because their own language is completely incomprehensible! ), and the usual set of posh shops in city centres. 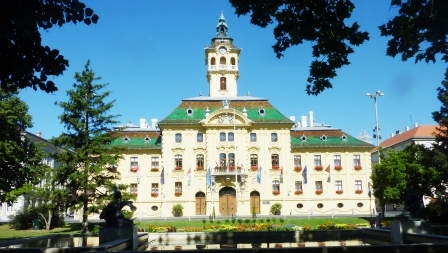 Szeged is the fourth largest city in the country, and its elegance and the lovely condition of its major buildings are both partly a result of the several floods it has suffered over the centuries. In its shady, grassy central square one of the several statues has on its base markers for two of the highest floods, showing how our heads would have been under water had we been standing there at those times. The worst flooding was in 1879, when the town was essentially destroyed. It was rebuilt with its wide avenues, several public squares, and restored buildings in an array of architectural styles. Its flood defences now include high banking on the city side of the river, with a roadway on the river side of it becoming a natural stage for all manner of events during what is now the period of the Szeged Festival. During our walk we enjoyed watching the dragon boats racing, and a conversation with a leading member of the British team revealed that these were part of a world championship of dragon-boat racing, with the main events taking place at another location in a purpose-built Olympic-standard rowing lake. In the afternoon we were treated to a completely different event, strictly for rev-heads, but watched by thousands of locals. The stars were 28 trucks, mostly just prime movers including a couple of Macks, plus a few complete fixed trucks as well. These competed in pairs in a drag race format along the riverside road; although the crowds were kept back by a ribbon of tape, it all looked horrendously dangerous from where we watched directly across the river. Worse were events by a couple of stunt cars and a motorcyclist, all of which did the usual array of burn-outs, wheelies and handbrake turns. A good time was had by all, with clouds of diesel and tyre smoke and the screams of loud truck horns. It all went quiet later, and the evening was peaceful. As was the night, fortunately. Warm to hot early, then on checking out found that the site office had mistakenly given our FIA International Camping Card to another camper, who had left with it. That was a right nuisance, because camp sites will usually accept holding the card rather than a passport, when that’s their custom to ensure you pay before you go. Also, there is a small discount for holders of the card at a few sites. All they could do is promise to chase it up and send it on to Australia. So, rather disgruntled, we continued west along the southern part of the Great Plain . Most roads in and around the plain are rather boring and straight, but in this case the frantic harvesting activity was an interesting feature. We stopped at a medium-sized supermarket to get bread, because the ATM in Szeged only spewed out 50,000 Hungarian forint notes (about $50 Australian), and bakeries don’t like big notes. So did a bit of a stock-up anyway, because the camp site didn’t charge us and we’ve probably got too much Hungarian money. Past Baja and through some National Park wetlands, and over some pleasant little wooded hills at the western edge of the plain, and down into Pecs. Once again, this is a place we went to in 2009, and we returned to the same family-run camp site, very small, with pitches shaded by walnut trees. The friendly lady told us that Pecs has been much tidied up since we were last here, because it was the 2010 European culture capital, so we agreed to stay and revisit the city tomorrow. Easy bus ride into the city. We had been told that as over-65s we should ride free; as usual in many parts of Europe we saw no evidence of anybody paying anything, and the driver certainly showed no interest! Pecs, as we remembered, is a most attractive city, and as we were told the buildings were all looking very smart with new coats of paint on walls and embellishments. We walked up into the centre from the southern walls of the old city, after first being summoned by a little old Jew into the large synagogue, a grand neo-Renaissance building. Before WW2 there were 5,000 Jews of high standing in Pecs, but in 1944 the Fascist Arrow Cross government had them deported to Auschwitz. Like most Hungarian Jews, very few survived, although there is now a flourishing Jewish community in Budapest. Just north we soon came to the big gently sloping central square, Szechenyi Ter, with the typical column in the centre commemorating the plague of 1720. The square is dominated by the former mosque of Gazi Kasim, now the Church of St Mary. From the square, what can be seen in the typical rectangular mosque shape with a huge blue dome; inside, what becomes apparent is that the furthermost wall has been opened up and behind it has been created a semicircular Christian church. This is backed by a modern organ that curves right round the semicircle, and the contrasting styles within the entire structure contribute to a harmonious whole. Further up from the square is the St Peter’s cathedral, dating back to 1009 but in its final form after several replacements now a 200-year-old Gothic structure. Leaning out of a balcony on the corner of a building in the cathedral square is a statue of Franz Liszt, looking expectant and quizzical. Bus back to the very shady little camp site. Checking out, the camp site lady asked why they were getting so few visitors this year, a complaint that as already noted we had heard several times before in this trip. We agreed that the dominant feature was the economic situation in Europe, with uncertainty creating unwillingness to spend despite governments encouraging it to boost their economies. She did comment that she was still getting several British travellers on their (she implied generous) pensions! I emphasised that we were not among them. We did make one small detour to the town of Nagyatad to see a collection of wooden sculptures. These are large structures, made to be able to be climbed on, laid out in a large paddock. Some do not represent anything identifiable, or are just structures like large wooden wheels, others are nicely carved statues of figures and animals. Rather sadly they are all in something of a state of inattention if not decay, and the field they stand in is becoming untidily overgrown. Intriguing, but we did not linger long; there was no one else there, but there were several more wooden statues and structures in the town, so perhaps that’s why few venture out to the fields to see them. From here we were soon in Austria – what a contrast, moving from the Balkan states with their old and new struggles, into one of the richest countries in the world. More to come . . .